GLASS DINING TABLE: Square, white wicker base, 4-foot, $75, four upholstered bar stools, $60. 941-794-0057. FOR SALE: DAHON folding bicycle. Large 26-inch wheels, 21 speeds, case included. Like new condition. Ideal for yachts and RVs. $350. Call 941-567-6022. FREE-STANDING BASKETBALL hoop in great condition, Call BJ, 941-778-3013. KING BEDSPREAD: BIRD of paradise print, $30. 941-779-1296. SIX OAK OFFICE chairs: Antiques, perfect for eclectic dining set. 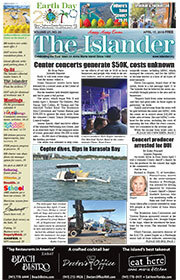 The Islander newspaper, 5604B Marina Drive, Holmes Beach. FURNITURE SALE: HALEY’S Motel. 9 a.m.-1 p.m. Saturday, May 2 only. Headboards, wrought-iron bed, dressers, dining, patio tables with chairs, stainless-steel refrigerator, dishwasher, matching stove. This is not a garage sale. Prices start at $50. 8104 Gulf Drive, Holmes Beach. WANTED: WORKOUT DVDs and retired but working XBox, Wii units with games for Ministry of Presence for kids and teens in Haiti. Deliver to The Islander, 5604B Marina Drive, Holmes Beach. WANTED: YOUR OLD cell phone for recycling. Deliver to The Islander, 5604B Marina Drive, Holmes Beach. ANTIQUES, ART, and collectibles. View at The Islander store, 5604B Marina Drive, Holmes Beach. FREE GUN LOCK courtesy of Project Childsafe, Florida Fish and Wildlife Conservation Commission and Holmes Beach Police Department. Pick up at The Islander office, 5604B Marina Drive, Holmes Beach. Don’t be sorry, be safe. ROSER THRIFT SHOP: Open 9:30 a.m.-2 p.m. Tuesday, Thursday, Friday, 10 a.m.-1 p.m. Saturday. Annex open mornings same days. Donations accepted 9-11 a.m. Wednesdays. 511 Pine Ave., Anna Maria. 941-779-2733. STEFF’S STUFF ANTIQUES and Consignment. steffsstufflbk.com. Open daily. 941-383-1901. MOVING SALE: 9 a.m.- ? Saturday, May 2. Oak entertainment center, computer desk and chair, ‘man cave’ contents, 3X men’s clothing, beer glass collection. All must go! 106 77th St., Holmes Beach. FOUND: SUNGLASSES, TWO PAIR. Found on beach at 77th street, Holmes Beach, April 23. Claim at The Islander office, 5604-B Marina Drive, Holmes Beach. FOSTER HOMES NEEDED! Rescued pets looking for great new homes! Please, call Moonracer Rescue for information, 941-896-6701. www.moonraceranimalrescue.com. FOR SALE: 2007 Cadillac DTS. Black, good condition. Going north, below retail. Call 612-384-9076. PONTOON BOAT RENTAL Create life long memories. Call 941-518-3868 or see boatflorida.net. WANTED TO RENT: Boat slip and lift, long-term, Holmes Beach area, for 21-foot outboard, 8-foot, 9-inch beam. Owner is part-time resident. Please, call Mark 813-748-4669. EXPERIENCED REAL ESTATE sales associates wanted. Generous commission split. Call Julie Royal or Mary Ann Schmidt at SunCoast Real Estate. 941-779-0202. IMMEDIATE OPENINGS: PART-time sales. Evenings and weekends a must. Retirees welcome. Inquiries, 727-244-5906. NEEDED: FRONT DESK and housekeeping. Full and part-time available. Must be outgoing, energetic and be able to climb stairs, some lifting. Schedule will vary. Apply at 2502 N. Gulf Drive, Bradenton Beach. TEAM PLAYERS NEEDED: Busy AMI deli has two part-time deli clerk positions available. Great opportunity to work 10-15 hours per week for extra spending money. Must be flexible, have good people skills. Apply in person, Jessie’s Island Store. 5424 Marina Drive, Holmes Beach, ask for April or Jimmy. No phone calls, please. PART-TIME BEACH attendant wanted for Longboat Key resort. Must be able to sail and possess great people skills. Call 941-383-5511 for more information. ADMIN ASSISTANT: APPOINTMENT coordination, event and meeting planning, make travel arrangements, record keeping, bookkeeping, scheduling. Send your resume and salary expectations to ebtey9@gmail.com. 305-900-5933. HELP WANTED: FULL-time or part-time. Longboat Key retail sales, evenings and weekends a must. Retirees welcome! Please, call 941-350-0228. HOME TRUE VALUE Hardware has a part-time or full-time cashier opening Wednesday-to-Saturday. Join our team that began 40 years ago. We make work enjoyable. Will train. Application forms available at the store or email hometvhardware@aol.com, attention Tony. 5324 Marina Drive, Holmes Beach. 941-778-2811. REPORTER WANTED: Full-to-part-time. Print media, newspaper experience or journalism degree required. Apply via email with letter of interest to news@islander.org. RED CROSS-CERTIFIED babysitter and high school honor student. Call or text Isabel, 941-545-7995. KIDS FOR HIRE ads are FREE for up to three weeks for Island youths under 16 looking for work. Ads must be placed in person at The Islander office, 5604-B Marina Drive, Holmes Beach. LPNS NEEDED FOR active quadriplegic using Hoyer lift. Morning shifts, 4-5 hours starting at 7 a.m. Overnight shifts, 9 p.m.-7 a.m. 941-685-5213. TOASTED COMPUTER SERVICES. Your home and business specialist. On-site service, virus/spyware, cleanup, system setup, upgrades, diagnosis and repair, internet/wireless networking, custom system design. 941-224-1069. I DON’T CUT corners, I clean corners. Professional, friendly cleaning service since 1999. 941-779-6638. Leave message. TRANSPORT SERVICE: LET me drive you to the airport or anywhere in Florida. Flat rates. Reasonable. Call Mike, 941-567-6634. CLEANING RESIDENTIAL, COMMERCIAL and resort. Love what we do, love to work. 941-756-4570. PRESSURE WASHING AND windows: Commercial, residential and resorts. Roofs, buildings, houses driveways etc. 941-251-5948. CLEANING BY LAURA offers everything on your list, from kitchen and bath cleaning to dusting and emptying wastebaskets. 941-539-6891. WILDLIFE REMOVAL AND relocation: Problem solving for all animals, big and small. Call Joe, Westcoast Nuisance Wildlife Service. 941-720-4152. CARPET CLEANING: QUALITY Counts Carpet cleaning. Upholstery cleaning. Tile and grout cleaning. Pet/wine stain removal. Manatee Chamber member. Great price, free estimates. Local owner. Call 941-756-1082. U FLY I drive your car anywhere in the USA. Airport runs, anywhere. 941-746-5651, 941-545-6688. HOME OR CONDO checking while you’re away. Home checking from a team you can trust! Contact Peace of Mind Home Services, 401-480-2708 or email Peaceofmindfl2@gmail.com for rates and services. EXECUTIVE CHEF SERVICE: Consulting and private chef duties. Vincenzo Esposito, Executive Chef, 941-773-9923. www.executivechef-servicesolutions.com. PROOF, POST, PUBLISH: Local editor-writer available for consulting, draft editing, final proofing and copywriting, as well as social media management for your group or business. Email Lisa Neff at lmneff@me.com. BEACH SERVICE air conditioning, heat, refrigeration. Commercial and residential service, repair and/or replacement. Serving Manatee County and the Island since 1987. For dependable, honest and personalized service, call William Eller, 941-795-7411. CAC184228. ISLAND LAWN SPRINKLERS repairs and installations, watering the island for 15 years. Jeff, 941-778-2581. JUNIOR’S LANDSCAPING AND MAINTENANCE Lawns, native plants, mulching, trimming, hauling, cleanups. Island resident 25 years. Call 941-807-1015. SHELL DELIVERED AND spread. $50/yard. Hauling all kinds of gravel, mulch, top soil with free estimates. Call Larry at 941-795-7775, “shell phone” 941-720-0770. STRAIGHT SHOT LANDSCAPE. Specializing in old Florida seashell driveways and scapes. Free estimates. Call Shark Mark, 941-301-6067. NATURE’S DESIGN LANDSCAPING. Design and installation. Tropical landscape specialist. Residential and commercial. 30 years experience. 941-729-9381, 941-448-6336. HANDYMAN SERVICE: 25-year Island resident. We do all repair, handcrafted work, interior/exterior. The Flying Dutchman, 941-447-6747. PAINTING: DONALD PERKINS Painting LLC. Interior, exterior. 40 years experience. Fully insured with references. 941-705-7096. ISLAND PROPERTY MAINTENANCE and repairs: 25 years, 24/7, locally owned, free estimates. Call Joe Naples, 941-487-0073. SOUTHBAY HOME REPAIRS: If it’s broken, stuck, loose, leaks, needs paint, etc. I’ll fix it. Affordable quality work. 941-720-2906. SOUTHWEST HOME IMPROVEMENT: Michigan builder, quality work guaranteed. Affordable, timely, within budget. Call Mike, 1-616-204-8822. 2BR/2BA HOME: GROUND level, updated, large lanai. May-October. $1,100/week. 941-893-0039. AVAILABLE WINTER SEASON 2015-16: 2BR/2BA ground level with carport and patio. 1.5 blocks to Gulf. Updated, must see! Anna Maria. 941-565-2373. 2BR WATERFRONT CONDO with boat slip, pool, washer and dryer, six months plus. $1,100/month, security and last month rent. No dogs. Elizabeth, 941-538-8622. PERICO ISLAND: 3BR/3BA, private pool available June-September. Includes club facilities. Monthly, $2,500-$3,100. www.pericoholidayvilla.co.uk. 941-795-3778. FOR RENT: 1BR/1BA condo. Beachfront first floor, pool, two-month minimum. Available. May-January. 941-747-8454. ANNUAL: WEST BRADENTON townhouse. 3BR/2.5BA, two-car garage. No pets, no smoking. $1,500/month. Credit check. 847-530-8833. REAL ESTATE: BUY, sell, invest. Enjoy. Billi Gartman, Realtor, Duncan Real Estate. 941-545-8877. www.AnnaMariaLife.com. CANALFRONT: RECENTLY RENOVATED 2BR/2BA villa with dock. Near Intracoastal with no bridges. Great soon-to-be gated community. Pet friendly. Bradenton. Yes, you can have it all. $249,900. Katharine Pepper, RoseBay International, 941-751-0582 or 802-363-9973. VILLAGE GREEN 2BR/2BA, two-car garage. FSBO. 1,803 sf living area. $162,000. villagegreencondo4sale@gmail.com. 213-999-6463. LOWEST PRICED WATERFRONT home on Anna Maria: Fantastic view, 2BR/BA Seaside Gardens villa. New Ikea kitchen, granite, stainless steel and energy efficient LED. $370,000. Call Capt. Steve, 970-846-7394 or email captnse@gmail.com. WATERFRONT CONDO: GROUND floor, 2BR/2BA, laundry room, two patios, pool, hot tub, tennis courts and low association fees. $429,000. 570-242-1922.